If you’d like to attend but are unable to, you can submit written testimony online by sending an email to edtestimony@cga.ct.gov. Please make sure to reference the bill number you are submitting testimony for/against and copy me on the email at: Noreen.Kokoruda@housegop.ct.gov. Electronic testimony needs to be submitted no later than 3:30 PM on Thursday, Feb. 28th. To reference or read the consolidation related bills, please click on the links below. Proposed Bill 457, An Act Concerning the Size of School Districts. 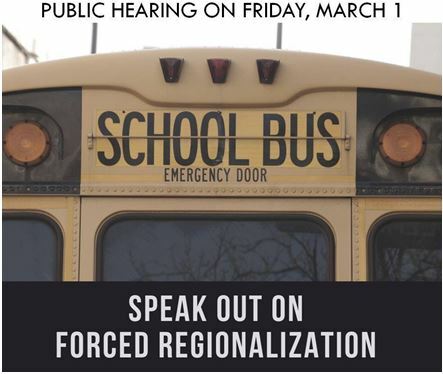 Proposed Bill 738, An Act Concerning the Creation of Regional School Districts. Proposed Bill 874, An Act Concerning Education Initiatives and Services in Connecticut. As always, if you would like to speak with me about a concern regarding state government, please email me at Noreen.Kokoruda@housegop.ct.gov or call 800-842-1423.